Quick and easy assembly instructions for your metal star. Start with the top tip of the star, the hang tab is on the back of this one. Place the second tip to the first tip so that the corresponding holes are lined up (the flange will be hidden under the first tip). Insert screws and tighten. 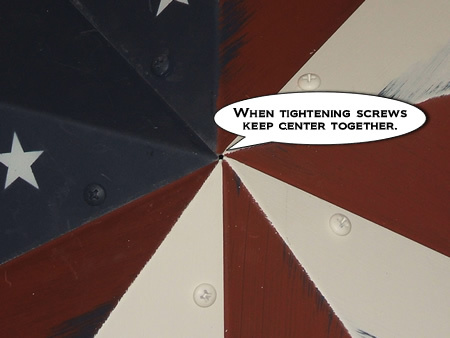 NOTE: When tightening the screws pay close attention to the center of the star to ensure that the center points meet together while tightening. 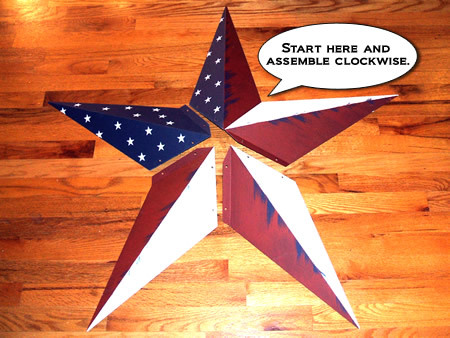 Repeat assembling each tip until the star is completely assembled. Screws are enclosed with your order to correspond with the tips. Please use care when assembling your star. We use Severe Weather exterior latex paint. The paint is durable but it isn't screwdriver-proof. 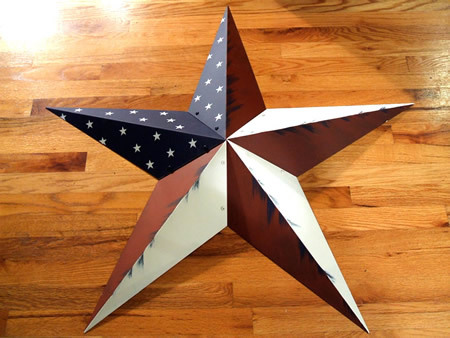 Hang your Barn Star and enjoy!